The Healthy Hoff: Oh Yes I Did! 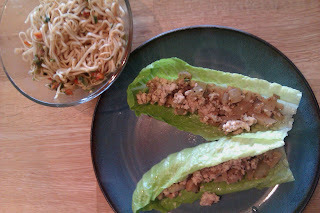 Tonight I was in the mood for Hoff's Chinese Lettuce Wraps and was not in the mood to cook anything else. But, these wraps do not an entire meal make. So, I thought about it and wondered if I could get away with a McDougall Teriyaki Noodle Cup (just add boiling water) as a side dish. I typically reserve these cups for snacking. The answer would be - YES! The two paired perfectly together & was filling enough for two, just be sure to make one noodle cup for each person!